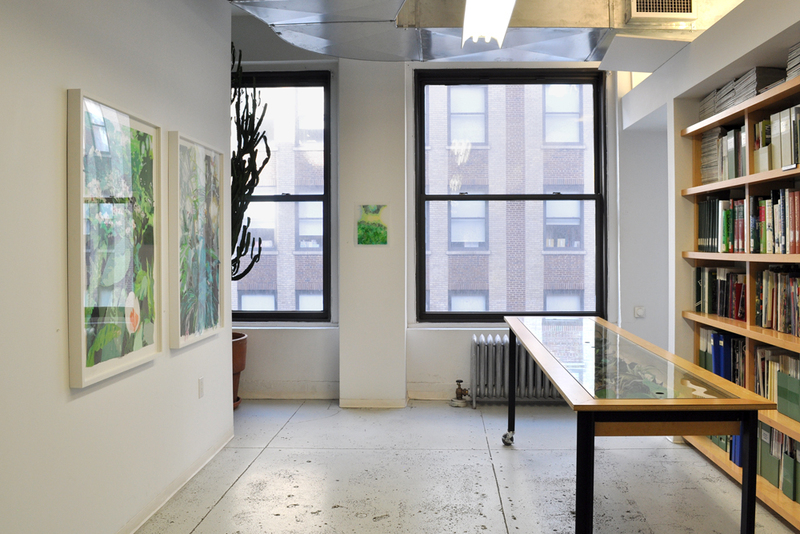 Installation view: Naomi Reis, Borrowed Landscapes, The Horticultural Society of New York, Project Space, August 7 – September 13, 2013. Installation view: Naomi Reis, Borrowed Landscape (Tropics of Africa, Asia and the Amazon via Kyoto), 2012-13, and Borrowed Landscape (Tropics of Africa, Asia and the Amazon via The Bronx), 2013, Mixed media collages on paper, 43 1/4 x 30 3/4 inches each (framed). Naomi Reis, Interior (Winter, the Bronx), 2013, Acrylic and mixed media collage on paper, 14 x 11 inches. Naomi Reis, Flower Arrangement of Lasting Art: New York, NY, Made in China (detail), 2013, Artificial and live plants, cut tropical foliage, recycled ink and acrylic drawings on mylar, Dimensions variable.